or Jean and Gary, the simple beauty of St. George Island , Eastpoint, and Apalachicola are a “Generational Treasure.” The two first experienced SGI in 1973 while attending Florida State University. The couple fell in love with the area, and couldn't wait to share the natural beauty and laid back lifestyle with their whole family. 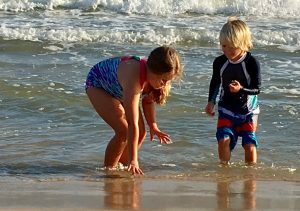 As time went on, St. George Island and the surrounding area became a regular vacation destination for Jean, Gary, and their children. Today, Jean and Gary call Franklin County home and are sharing the love of the area with a new generation: their two grandchildren. In addition to their many years of experience in the local community, Jean and Gary bring a wealth of practical knowledge to the home buying experience. Jean is a past member of the Franklin County Planning and Zoning Commission. She is currently a Member of the MLS Committee for the Realtor Association of Franklin and Gulf Counties, and is a Member of the Board of Directors for both the Realtor Association of Franklin and Gulf Counties and the Apalachicola Bay Chamber of Commerce. Jean helps bring the historic charm of Apalachicola to life by actively participating in Trinity Episcopal’s “Pillar Program” for the annual Historic Apalachicola Home and Garden Tour. Jean has expanded her skills over the course of her career, earning Resort and Second Home Property Specialist (RSPS) and Graduate Realtor Institute (GRI) designations as well as her Broker’s license in 2013. Gary brings his extensive homebuilding experience to the team and maintains a certified residential contracting license and a registered builder license. Gary began building homes on St. George Island in 1987, and is an active building contractor operating in the Franklin County area. He became a licensed realtor in January of 2009. His contracting experience has been an asset to the team, allowing them to provide current information to clients regarding county zoning, the county building permitting process, and homesite selection. Gary has been involved in the community throughout his time in the area. He is a past member of the Apalachicola Main Street Program, the Apalachicola Historical Society, and the Florida Trust for Historic Preservation and currently serves as a Trinity Episcopal Vestry member. Both Jean and Gary are current members of the Apalachicola Bay Area Chamber of Commerce, the Realtors Association of Franklin and Gulf Counties, the Florida Association of Realtors, and the National Association of Realtors. Ready to share in the “Generational Treasure” that is Franklin County? Call today! With practical knowledge and a personal connection to the community on St. George Island, Eastpoint, and Apalachicola, Jean and Gary make the perfect team for your property needs.